Normandy Life: Mosaic Monday # 28. Edinburgh Castle, Scotland. Mosaic Monday # 28. Edinburgh Castle, Scotland. Today I'd like to take you on a brief tour of Edinburgh Castle. to live there in 1074. Here's what I found about Malcolm from wikipedia. He was the eldest son of Duncan I who became King of Scotland in 1034. Duncan's reign was cut short when he was murdered by Macbeth in 1040. 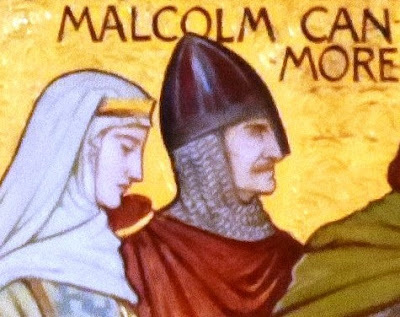 Macbeth ruled for 17 years until he was killed in 1057 by Malcolm. Macbeth's stepson Lulach was crowned King and was murdered by Malcolm in 1058.
when he was succeeded by his eldest son, by his first wife, Duncan II. Saint Margaret's Chapel, 12th Century. and dedicated to his Mother who died here in 1093. She was created a Saint in 1251. There are many wonderful things to see within the Castle grounds, click here for more info. The crown jewels of Scotland are a breathtaking sight. 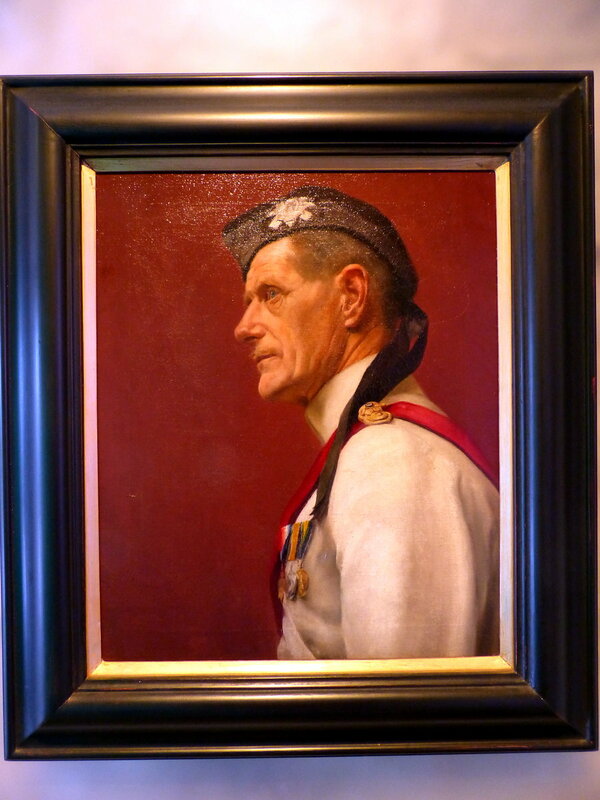 Known as The Honours of Scotland they are displayed in the Crown Room and are surrounded by a special exhibition. The sceptre was presented to James IV by Pope Alexander VI in 1494 while the crown was first worn for the coronation of James V’s wife Mary of Guise in 1540. They were first used together for the coronation of Mary Queen of Scots in 1543. Their past has been turbulent. They were removed and hidden from 1651-60 to keep them from Cromwell’s Parliamentarian army. In 1707 they were locked in a chest and sealed away after the Treaty of Union between England and Scotland. In 1818 they were rediscovered by the novelist Sir Walter Scott, and with them a mysterious silver wand. Sadly we didn't have enough time to see the Crown Jewels when we visited in September 2014 but we did enjoy the Regimental Museum of The Royal Scots Dragoon Guards. depicts the 93rd Highlanders at the Battle of Balaclava, 1854. 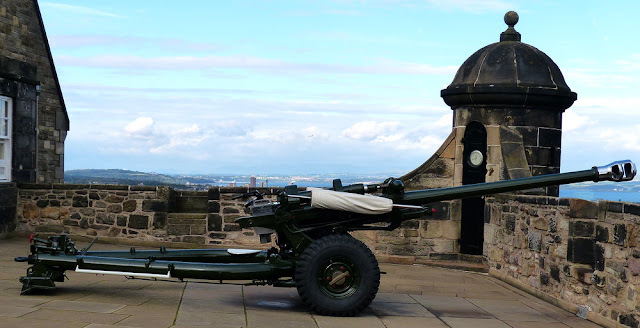 At 1pm every day (except Sundays, Christmas Day and Good Friday) the One o'clock gun is fired and is a great draw for visitors to the Castle. to set the Maritime clocks by which they navigated the worlds oceans. 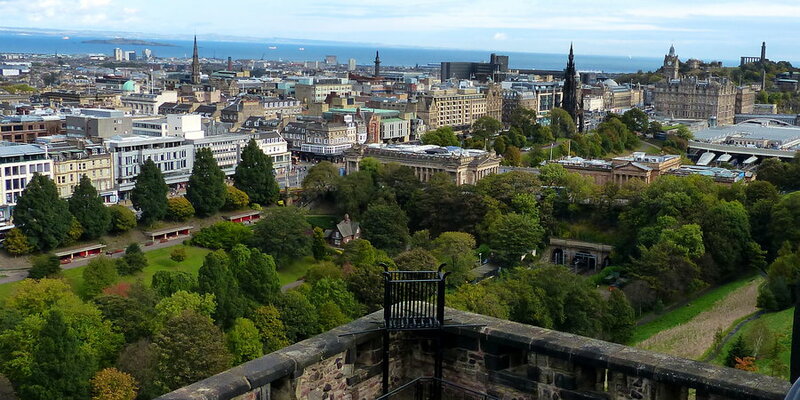 Standing on its great rock, Edinburgh castle dominates Scotland’s capital. Great events have taken place within its wall and it has witnessed many sieges. To control the castle was to hold the keys to the kingdom. Iron Age warriors understood the rock’s military potential and built a hill fort here. Our oldest poetry tells of a war band which feasted here for a year before riding to death in battle. During the Wars of Independence the castle changed hands many times. In 1314 it was retaken from the English in a daring night raid by Thomas Randolph, nephew of Robert the Bruce. The castle was home to kings and queens. Queen Margaret (later St Margaret) died here in 1093, and Mary Queen of Scots, gave birth to James VI in the royal palace in 1566. 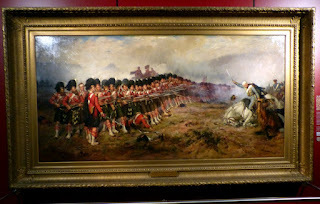 Her great-great-great grandson Charles Edward Stuart - Bonnie Prince Charlie - captured Edinburgh but couldn’t take the castle during the 1745-6 Jacobite rising. In 1996, the Stone of Destiny, on which kings were enthroned for centuries, was returned to Scotland and is displayed in the Crown Room. 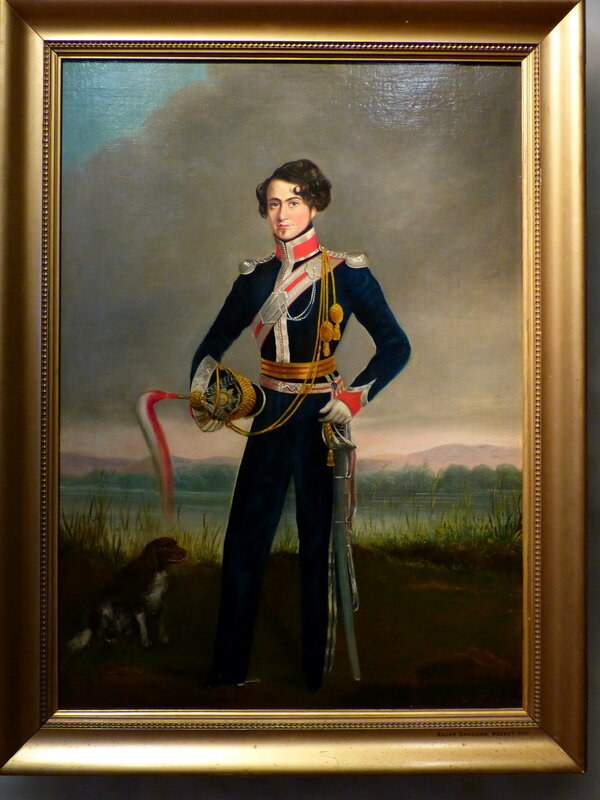 From the 1600s onwards the castle was a military base with a large garrison. Later it also held prisoners of war. Parts are still a military base, but the castle is now a world-famous visitor attraction and a key element of the Edinburgh World Heritage Site. over the city across to the Firth of Forth in the distance. indicating various parts of the city. of what the city has to offer, one day. with the Edinburgh Film Festival or Edinburgh Fringe. Oh how I'd love to visit that castle! I am reading the Isabel Dalhousie mysteries by Alexander McCall Smith, and the city is every bit as important to the stories as the heroine. I hope to join in on Mosaic Monday next week....slowly working my way back up to it. A castle...well, you know we have so many of them in the U.S.! lol! This is a very interesting post. I knew absolutely nothing about King Malcolm, so thank you! Thanks, Maggie, for once again hosting MM. I'll be back tomorrow evening to read your post - I want to spend some time at it and not rush through. It looks so interesting. Fantastic photos of this historic castle. It's years since I last visited England. I so wish I could do it. Have a great week Maggie! Maggie, thanks for sharing all these great photos and the information. We visited Edinburgh in the 1980s. I would certainly love a repeat visit. Thanks for hosting Mosaic Monday! Gorgeous photos of your visit to Edinburgh Castle. Such intriguing history, stunning architecture and spectacular landscapes most certainly deserve a visit, for they were/are the inspiration for so many different works of art! Thanks for hosting! Happy Mosaic Monday! What a great post on the Edinburgh Castle. We would love to visit Scotland one day has my husband has Scottish heritage. His mothers name was Lorna Doone Campbell! Edinburgh would be near the top of the list of course so I'm taking special note of your post and the wonderful information! Great place with lots of history. 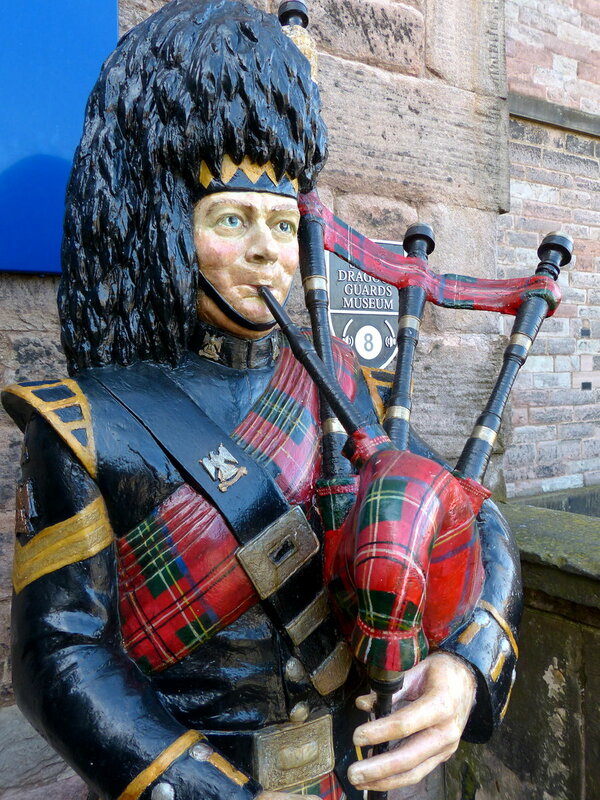 We would love to visit Scotland one day, husband's ancestors are from there. thanks for the tour. 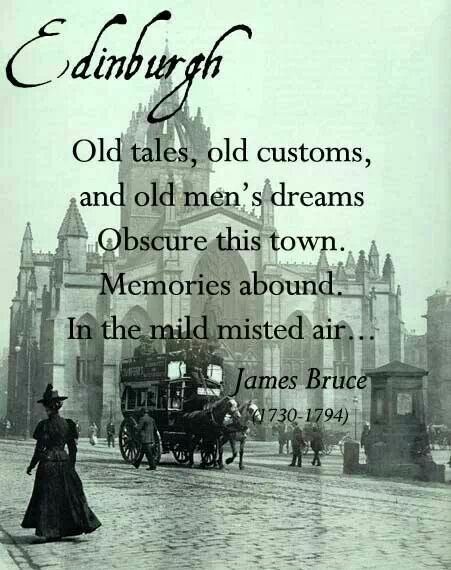 Edinburgh Castle is somewhere I would love to visit one day. So much history. Have a fabulous week. Arm chair traveling at its best! Loved seeing Edinburgh Castle through your eyes. Have a delightful week and thanks for hosting! Ah! What lovely shots, Maggie... You've brought back wonderful memories of my visits to this fine city. Edinburgh is one of those spots I read about but have never visited and have few photo references for so seeing this was particularly fun. There's a boatload of history in this castle and if those walls could talk, what incredible stories they would tell! Good morning from the Pacific Northwest. Loved all the great information about Edinburgh Castle. 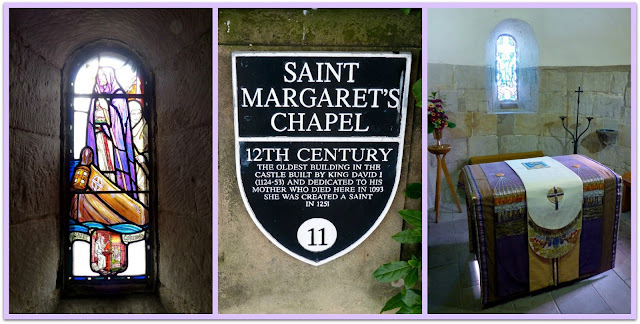 I especially honed in on Queen Margaret being the kinswoman of King Edward the Confessor. One of the mosaics I'm sharing today was a group of photos we took at St. Edward (the Confessor) Park in Kenmore, Washington. On a previous post I showed the crest of King Edward the Confessor that we saw on the seminary at this park. Fun coincidences. Thank you for hosting MM Maggie! What an interesting and well preserved part of history! It seems there were so many brutal murders and successions of kings in Edinburgh Castle--I wonder if it is haunted in any way? The view of the from the castle was magnificent. I'd love to visit Scotland one day and see this myself. Thank you for the wonderful tour! 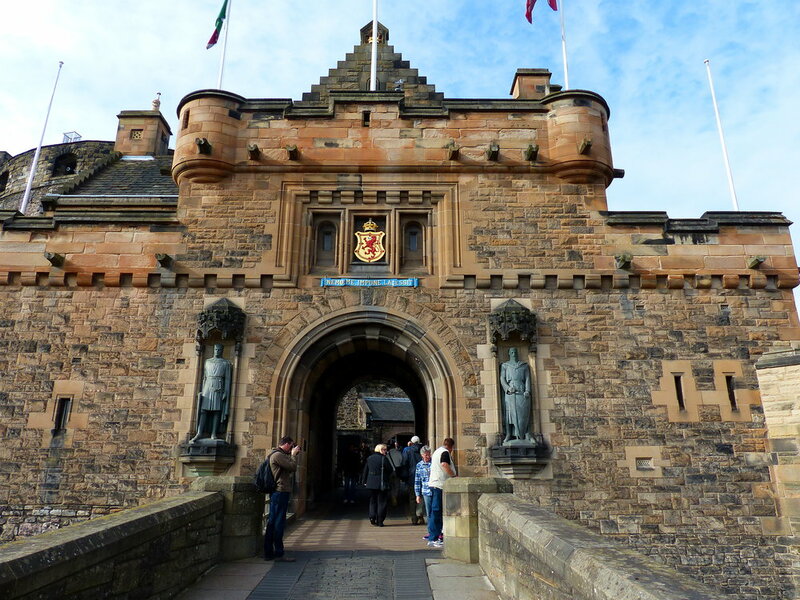 Thank you for sharing some of the history of Edinburgh Castle. Thank you for Mosaic Monday too. 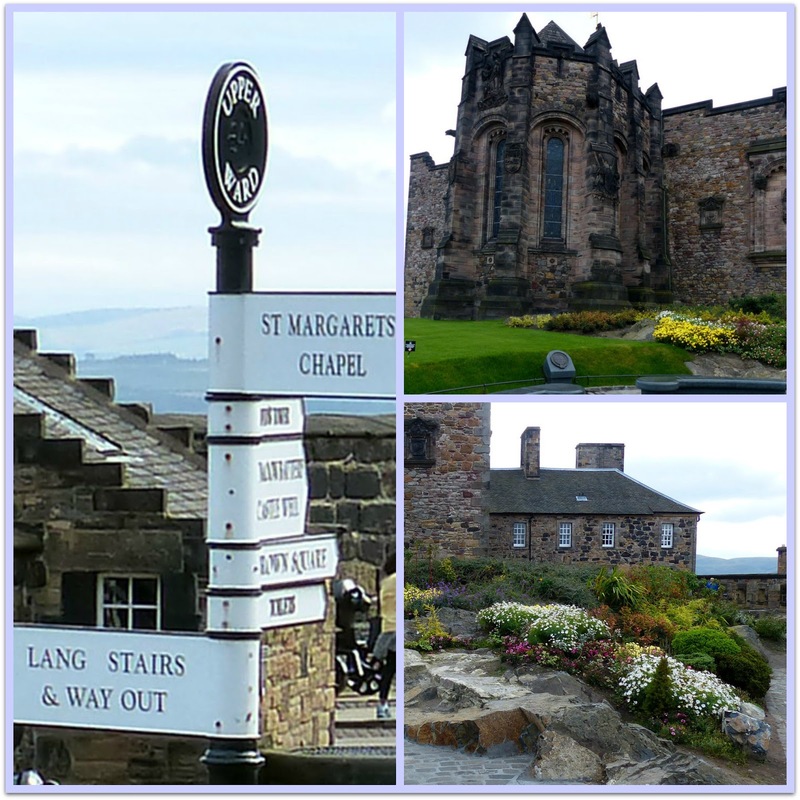 Thank you Maggie for sharing your trip to Edinburgh Castle and thank you for hosting Mosaic Monday. I enjoy seeing the pictures and reading the history you share. Wow - very interesting history - and great photos. I really liked the part about the cannon firing to set clocks by - plus so much else of interest. It will take me some time to go through all the info - thanks so very much. I'm fascinated by castles and all that goes with them. I would love to visit that castle too! Thanks for the valuable information and the wonderful pictures. And thanks once again for hosting! This is an amazing post. I love castles and have every intention of visiting Edinburgh castle some day (soon). Now I'm even more eager to see it. your post on a magical place in Scotland. I visited Scotland in 2011. I traveled with three ladies to the island of Iona. What a great post, Maggie. I'd love to visit Edinburgh Castle someday. All that wonderful history. I'm glad the Scots were able to hide their treasures (at least some of them) from Cromwell's army. Thanks for the reminder that while democracy isn't perfect, murdering leaders was worse! Thanks for hosting Mosiac Monday Maggie. Thanks for droppin at my blog to view mine. I would love to visit Scotland. Just this morning I finished a short story by Alexander McCall Smith in the Isabel Dalhousie series. 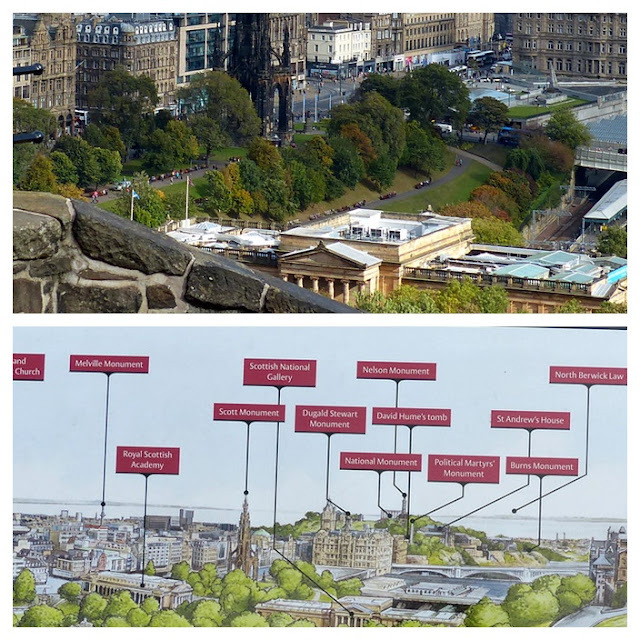 It's set I think in Edinburgh and makes modern day Scotland sound so interesting -- and obviously from your post, its history would be beautiful to see and learn about. A castle I've always wished to visit, and maybe someday. Meanwhile thank you for the photos. Have missed joining in MM but will try this new week again.